A friend of mine said games should preferably have sword fighting, magic and brave heroes who risk their lives for a higher purpose. 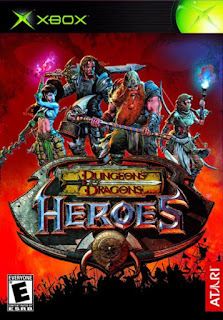 “D&D Heroes” fits that description and if you have played an action role playing game you already know its basic characteristics: plenty of monsters to kill, lot of treasure to collect and many skills to upgrade in a setting which brings Lord of the Rings to mind. 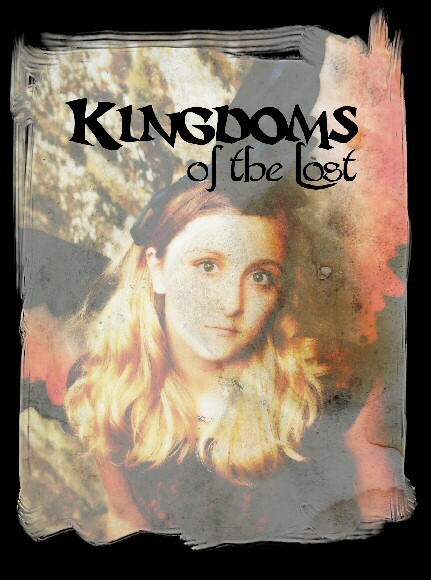 As for the story, it is as basic as possible: four noble heroes must save a medieval kingdom from a powerful villain and to accomplish this feat they must explore distant, strange lands and acquire objects of arcane properties. Τhe game world can be divided in seven big areas. The first one is a series of caves and crypts, with spiders, skeletons and hobgoblins. Playing with a sorcerer (there are also a rogue, fighter and cleric to choose from), my staff and magic missiles were enough to take care of them. 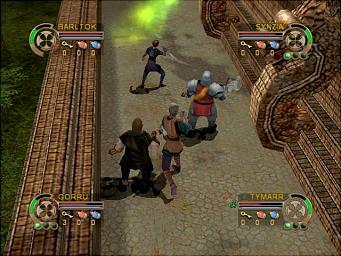 As in “Baldur’s Gate Dark Alliance”, the wizard is effective at close combat, although she cannot use all weapons. You start with leather armor and if want to wear the better suits of armor available later you will need to invest in the appropriate skills. Another thing you do early in the game is discover a soul shard; there are 20 soul shards in total and whenever you collect five of them your “ancestral weapon” is upgraded. However, even when I had 15/20 soul shards my ancestral weapon was not impressive so, I would not recommend searching for them frantically. At the end of the first area you fight a huge lizard which charges with its head. Then you exit the caves, cross a swamp with poisonous plants, trolls and pools of stale water, and reach a castle. The castle is inhabited by a group of unfortunate adventurers and a shopkeeper (how convenient). 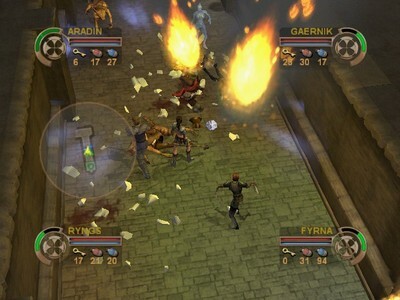 Gradually you gain access to new places, including a stone temple, barracks and the dungeons. I liked the castle because I had the chance to fight drow and mind flayers. These ugly creatures attack with a variety of spells, including telekinesis, and even hit you with their freaky face tentacles if you get too close! Finally, you reach a chamber that leads to four elemental planes and is guarded by a beholder, which reminded me of Dark Alliance. To progress in the first elemental plane you should possess poison resistance because you are often hit by snake-men called yuan-ti and spiders that jump on you. After crossing a yard with spike traps and statues spitting poison gas you climb on huts and rope bridges constructed on giant trees. You press four colored plates in the correct order and enter the lair of the plane’s boss, a green monster like a dragon. Once you kill it you acquire a gem that opens the gate to the second plane, which is ruled by the element of fire. There, you find automatons used for mining, giants immune to fire, lethal flame jets and streams of molten metal. Five diamonds must be collected, one of them being kept by an elf locked in a cage while the others are scattered around. I like how the automatons ignore you unless you interrupt their work and how you reach a soul shard on an elevated platform by entering a small opening in a wall. At the end of the mines you fight a red dragon, which looks impressive and shoots waves of flames. 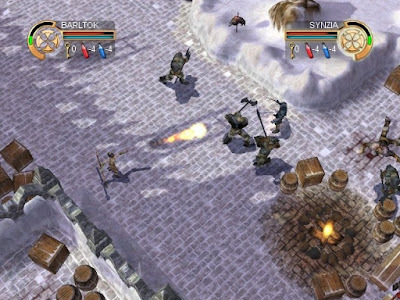 Next, is a frozen world populated by barbarians with big axes. A witch comes out of nowhere and asks you to kill some ice golems that went out of her control. You explore the area and pull levers that open another closed door which leads to a wurm, a creature like a giant worm. What follows is the plane of the dead, which is more dangerous, as you fight hordes of skeletons and monsters that can kill you almost instantly if you get caught in their magical blast. Once again you must search around to find objects that give access to the boss, a necromancer that reminded me of Mumm-Ra from Thundercats. If you have gone this far you can enter the wizard’s castle, which resembles the onyx tower from D.A. I know I think of D.A. very often but there are even gargoyles and metal golems here, so what else can I say? You move in corridors and chambers made from expensive material, pull levers, again, and fight the wizard repeatedly, forcing him to retreat until the final confrontation: every time I thought he was gonna bite the dust he used one of the gems to replenish his health; as a result, this fight was longer than usual. 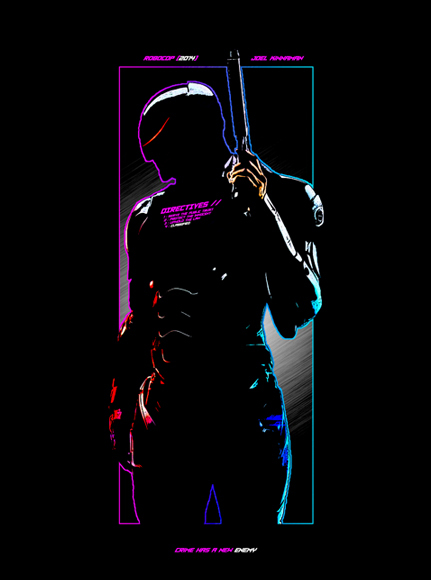 When he finally died, I watched an uninspired ending sequence and the game was completed. Was it good? Let me explain. Starting with the graphics, they are nice but nothing special; compared to those of D.A. they lack in style and atmosphere and the heroes’ models are less attractive. The visual and sound effects simply do the job, the music lacks the epic touch that would be suitable in this context and the voice acting is forgettable, as the characters are not memorable either. The biggest disappointment is the plot, which is non-existent: at the beginning, you learn that an evil wizard threatened the kingdom centuries ago and four heroes rose to face him. After a fierce battle they beat him but the wizard killed them all with his last breath. Now he is resurrected and plans to do the same, so two dwarves bring back to life the same heroes to stop him, again. And that’s all, nothing new is added afterwards. With a world as massive and rich as the Forgotten Realms, you would expect to meet interesting characters, visit places with a long history or learn more about your hero, however this does not happen. 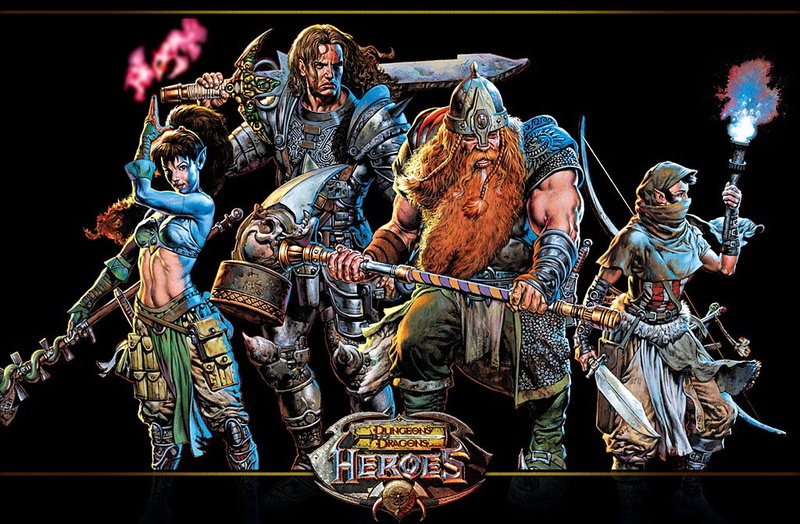 Despite its shortcomings, Dungeons Dragons: Heroes is redeemed by its fluid gameplay. Melee combat is effortlessly combined with special attacks, allowing you to confront groups of enemies quickly and effectively. Especially the elf sorcerer's fireball is awesome: it has an enormous area of effect, deals lots of damage, consumes little mana and can be cast very fast. In the last stage I often confronted about ten enemies at once but a meteor swarm and a couple of fireballs destroyed them in a few seconds. A handful of enemies are immune to fire but the ice sphere is more than enough to deal with them. I also liked the protective sphere the elf can create around her and the variety of equipment you find as you progress. 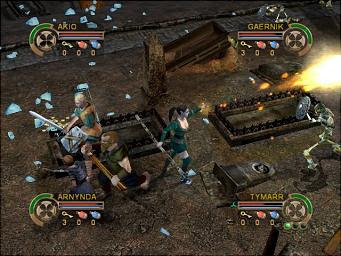 There are five types of armor (leather, scale, chain, splint, plate), with different qualities and bonuses, and weapons such as staves and tridents that have adequate range. Throwable items are available, for example daggers, axes and fire bombs, but if you play with the sorcerer it is better to sell them for cash. Skills include offensive spells, finishing moves for melee combat, armor bonuses and increased proficiency with certain weapons. When I finished the adventure many skill points remained unused, which means the game is generous with level ups. Concerning the shops, initially I could not afford the expensive stuff sold there but after a few hours I accumulated enough wealth to buy anything (I chose a helmet, gloves and boots). Another way to improve your character is by increasing your main attributes (strength, wisdom, etc); I increased my intelligence, which raises maximum mana and the spells’ power. Moving around is easy, thanks to a handy automap and the ability to teleport back to the castle by using a special crystal at a save point and return to the dungeon after you have sold unnecessary items and stocked up on supplies (mainly potions and keys for chests). The control system is very easy to learn (there are buttons for activating skills, using items, blocking, attacking, drinking potions) and the combat mechanism works in favor of the player: enemy attacks don’t interrupt yours and performing combos is as easy as tapping a button. The only drawback is that potions heal you instantly and you can carry dozens of them, so you don’t need any particular effort or skill to beat the game. In conclusion, Dungeons Dragons: Heroes is not a masterpiece, since its world and presentation are not fascinating and it lacks challenge. On the other hand, it offers a nice variety of monsters and each area has its own identity; smashing crates for loot never gets old and smashing heads with a long stick is satisfying; your power becomes overwhelming as you progress and stages do not last more than they should. 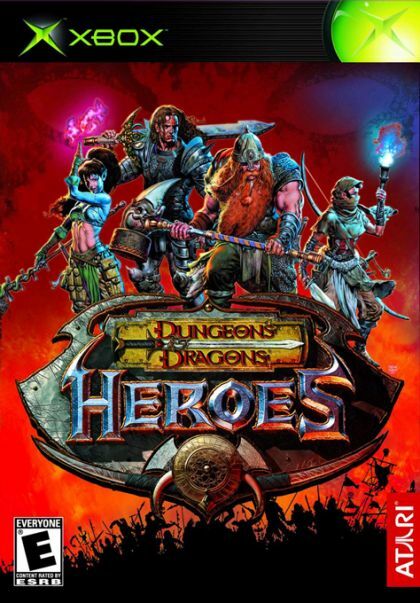 Taking into account that four players can enter the action simultaneously and there are three more characters you can try after finishing the game, Heroes is worth the time of an action/rpg fan who owns a XBOX.